Information on the Izzo Alex MKII comprising the Closer look (very detailed review), specification sheet, any manufacturer information and many photographs of the internals of this machine (most not used in the review). 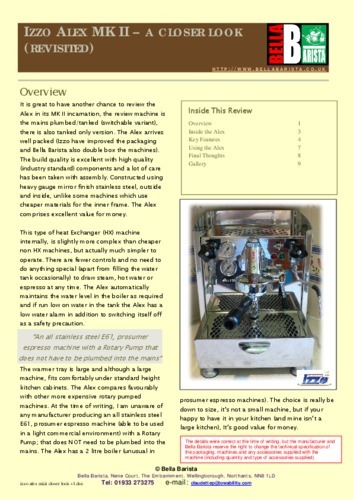 Please note: Even though the review is here, Bella Barista may no longer sell this machine or carry spares for it. Reference should always be made to the Bella Barista web site for the current range of machines sold and any spares stocked. In addition some of the reviews will be for earlier models of some machines that have since been updated. I have also many times been asked for reviews for machines that Bella Barista no longer sell, because to avoid confusion they removed the reviews from their web site. Bella Barista have given me permission to provide the information for all past and present machines as a service to members of the Bella Barista Coffee Club via the Coffeetime Wiki. The wiki will eventually contain this information for all current and past machines (and possibly some they decided not to sell after reading the review).